How Much Does Metal Siding Installation Cost? As a homeowner, you have a variety of choices when it comes to home improvement, and you may be considering metal siding installation. And why not? Other than a roof, a home’s siding is probably the most important decision. Not only does it protect your property, but it also adds to your property's overall curb appeal. It's also a low-maintenance material, perfect for areas with snow, sleet, frost, rain, wind and even heat. And if you are having problems with insects and your existing siding material, metal siding installation could be just what you are looking for. As with any project, you're going to want to know the projected cost to install metal siding for your home, as well as get some estimates from professionals in your region to get a feel for the current pricing trends. Naturally, the bigger the project, the more expensive it will be. Also, some jobs may take longer due to certain weather conditions at certain times of the year, which will influence the overall labor due to the installation taking longer. Labor: Labor is calculated as a separate charge. Most professional siding contractors charge $40 - $50 per hour, but they will also offer other services. If you have multiple contractors working on site at once, you could be looking at anywhere between $80 and $200 per hour. This can include carpenters, for instance, to repair any outside damage that may have been found once the existing siding was removed. Materials: The type of material you choose will also determine the price. Aluminum siding is around $3.50 to $4.75 per sq ft, whereas steel will cost anywhere between $4.30 and $5.50 per sq ft. Remember to compare estimates from several contractors while checking out their reviews before you commit to doing business with anyone. Just because a contractor is willing to quote you does not mean they have the expertise to actually complete the work up to standard. How Much Will It Cost To Install Metal Siding? If you have the knowledge and experience, necessary tools, and enough time, you could do your own DIY metal siding installation for as little as $1,250-$2,500 for an average 1,000 sq ft area. However, this type of project could be challenging, even for the most enthusiastic DIYer. The cost to install metal siding through a professional contractor averages out at around $3,000-$4,000, depending on project size and some other localized factors. At the top end, you could spend as much as $6,000, but also keep in mind that larger areas will cost less. A 3,000 sq ft area can cost $7,500+. To cut on costs, some homeowners have their metal siding installation done only on the front and sides of their home while leaving the areas which are not visible untouched. Additional material charges may include vapor barriers and channels to direct water flow, this can add up to $600 to your total cost to install metal siding. Another cost to consider during your installation is removal and disposal ( or recycle ) of your existing siding. Homeowners can expect this cost to range between $510 to over $1,000, depending on the size of your home and other factors. If you need a dumpster rental for debris and other project waste, you should add another cost of $150-$300 to your bottom line. Finding the right contractor that can expertly handle your unique situation is important. 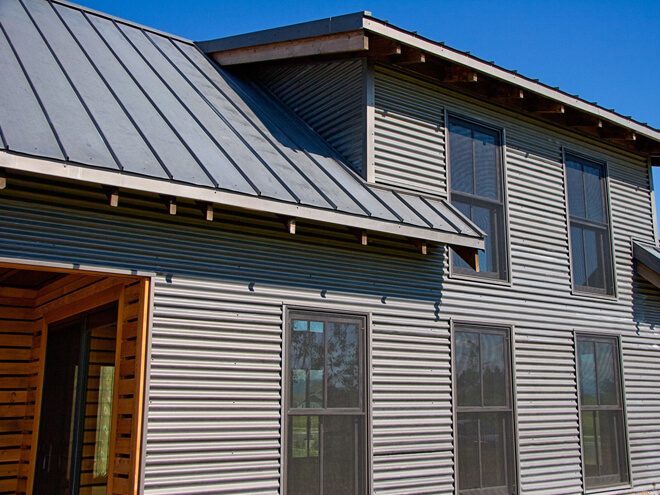 Their experience and skill can not only get the job done right, they allow a contractor to avoid costly mistakes which can significantly increase your cost to install metal siding. By simply entering your zip code in the space provided below, you can be connected with metal siding professionals in your area who are standing by to assist you. Be sure to take advantage of this offer now to secure your 100% FREE estimate on the cost to install metal siding on your home. By entering your zip code now, you are well on your way to improving the exterior of your home. And remember, there's absolutely no obligation to purchase, hire, or sign any contracts. Take advantage of this free offer today. The cost to install metal siding will naturally depend on the size of the area alongside several other factors. To get a more accurate idea of what you will be paying for your particular project, request a FREE estimate from a professional in your area.